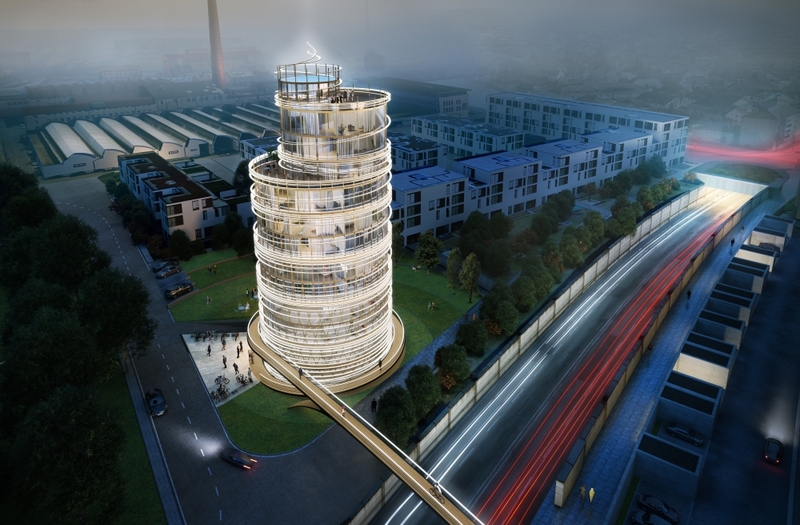 The Quatertower project aims at being a landmark of Augsburg's peripheric center, creating eleven levels of living and office spaces with a view of the old city. It adopts an unexpected form, and as such it creates a visible, recognizable identity. Its cylinder is creating a signal, vortex, point of reference and gateway between the old city and the TIM, Textile and Industrie Museum. The entire structure and secondary structural elements are made of timber. They refer to the weaving process displayed in the TIM museum. The external timber lattice structure is state of the art timber use in high rise buildings and refers to a deeper sense of tradition, arts & crafts, and weaving technique knowledge. The use of timber is seen as a connection to natural materiality, to carpentry and to traditional construction system. The geometry has been entirely generated with Rhino and Grasshopper, based on three tangent vertical cylinders fixing the program regulation in space. The primary façade structure is based on a variable diagrid projected. It is stabilized by the continuous logarithmic spiral, restraining the diagrid horizontally, and creating a dynamic visual movement.